$4 is for 1 16oz bottle of water charged to whatever frequency or song you wish. Also you can use this to upgrade any liquid elixirs on the Eck-tech site by having me charge whatever elixir you like with the frequency of your choice. If you want 6 things charged you can use the 6 pack and so on. Just remember to leave a note on your desires when you checkout. Didn’t your mother ever teach you not to mix electricity and water? Yes, she did, and that’s correct you shouldn’t do that because you could electrocute yourself. Aetheric energy is a different story; this energy is not easily contained for long. It slips through almost everything and there is no metal, glass or plastic that can contain it. Although it is attracted to certain things like water, geometric shapes, and quartz crystals. We’ve all experienced this energy when we get a shock after sliding our feet on the carpet and touching a metal doorknob or another person. By using my Tesla coil I made, which is known to produce static electricity (that I refer to as miniature lightning bolts or aetheric energy), I have created a way to reproduce the ancients water which empowers the spirit and the mind through the body. In the Grand Canyon, at an ancient Native American site, they found a room which had a lightning rod 3 inch in diameter descending through the cliff where it ended at a large water bowl in a small room. In this chamber, the walls were covered with white powder. This white powder is believed to be the same stuff found in the Kings chamber of the Pyramid of Giza. The Egyptians and the Israelites ate a food called Bread of Life or Manna Bread. This was a white powder made from gold which when heated to a certain temperature turns to a clear glass-like state, this crystal was then ground into a fine white powder and eaten. This powder turns on the sleeper genes that lie dormant within all of us, what modern scientists call junk genes. However these genes are far from junk, they are in fact genes from God himself. The bible says that man was made in God’s image and so he was. Your aura will return to its original state of glowing bright light surrounding your entire body, you will experience oneness. I’m sure you’ve heard that we only use a fraction of our brain and that’s because we have not been turned on yet. ‘Manna Bread’ will turn your brain on to its maximum power allowing your spirit to become alive and powerful. When you’re high in spirits it affects your mind which in turn affects your body. There are many references to white powder or manna included in the Egyptian Book of the Dead, as well as the Bible. You may be familiar with the story of Moses burning down the Golden calf mixing it in water and feeding it to the Israelites before they must go on a long journey. Moses, just like the Magi (the 3 wise men) knew of this ancient knowledge that has been lost over time. Life force energy, also known as Aetheric energy, works on the spirit level. When the spirit becomes sad, lost, unhappy, upset, or unable to fulfill its task, the body follows with sickness and disease, accidents and disorders of all kinds. Whatever has happened to the body has already happened to the spirit, so it does little good to address a body problem if you don’t address the problem of the spirit as well. It is commonly accepted that we are mostly made up of water and that it is imperative for us to consume it for our daily functions. The ancients always talked about a different kind of water. I’m sure you’ve heard of the stories of the Fountain of Youth or the Water of Life. We typically picture this as literally changing us to a childlike state rather than simply being returned in spirit and in health of a child who hasn’t accumulated any problems. Since taking these Ormus minerals and drinking this water daily I feel like I’m 18 again when I can eat anything I want, I haven’t got sick and I no longer have back problems. I’m mentally sharper and feel more connected to my higher self otherwise called my intuition. Sources of miracle healing water have been popping up all over the world the last few decades. It is even rumored that Magic Johnson visited the site in Tlacote Mexico where millions of people have traveled long distances to receive this water. Other places known to have this miraculous water around the world are Nordenau Germany, Nadana India, Lourdes France, and in China and Japan. Instead of traveling to these places it is now possible recreate this aetherically charged water. Can words and music really affect water? Dr. Masaru Emoto, a doctor of alternative medicine from Japan, has conducted many experiments on water crystals and have found that words and music have both positive and negative effects on water. Dr. Emoto's experiments have been published into several books, one of them the well known book The Hidden Messages in Water. His findings show that music has a big effect on water and therefore, on us as well, since we are largely made up of water. Dr. Emoto put water into containers and wrote or typed different thoughts and feelings on labels and put them on the containers. Immediately afterwards, the water was frozen and the combination of a microscope and high-speed photography resulted in photos of water crystals. Beautiful water crystals were formed when Dr. Emoto used beautiful words, such as love and gratitude, while misshapen and distorted crystals were formed when slang or swear words were used. Polluted water formed ugly crystals, but after polluted water was prayed over, prettier water crystals resulted. Such amazing findings show that words, both written and spoken, can actually have an effect on water. But what about music? 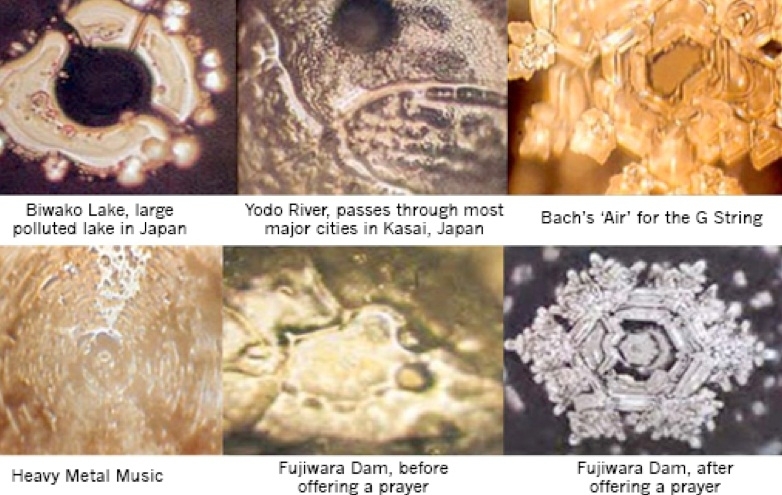 Dr. Emoto also did these water crystal experiments with music. 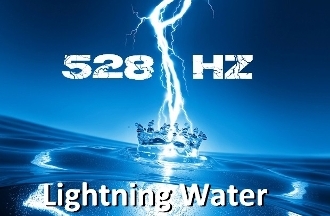 He put water between two speakers and turned on a specific piece of music for several hours. Then the water was frozen and photographed by Dr. Emoto. Classical music such as those by Beethoven and Bach resulted into beautiful water crystals. Dr. Emoto also found that the Tibet Sutra and the Kawachi Folk Dance all produced pretty water crystals. However, rock music did not have the same results - instead, rings of cracks showed up when the water exposed to rock music was frozen. These results by Dr. Emoto and other scientists since then have shown that some music have healing properties and others don't. What's even more amazing is that music actually has an effect on a non-living, physical matter. Since 70% of our bodies are made up of water, we can apply the healing properties of classical music to our own bodies. Every piece of music has different frequencies, and these frequencies can reach different parts of our body to assist our immune systems and minds to achieve healing and other positive effects. Dr. Emoto has said that he sees energy as vibrations moving through matter. These vibrations are called hado by Dr. Emoto. Hado translates as wave motions or vibrations. For example, listening to The Moldau by Bedrich Smetana can reduce irritability and energize the lymphatic tissues of the body. Dr. Emoto attributes this to the hado in the music that can cancel out the hado of irritability. The music also resonates with the hado of lymphatic system. Other examples include listening toThe Blue Danube by Johann Strauss II will revitalize your central nervous system, while listening to the opera by Richard Wagner will remove the hado of self-pity from your thoughts. In all, Dr. Emoto and his research and findings on how music affects water has profound implications for us and the role music plays in our lives.